– Foreclosures are now 27% cheaper than non-distressed houses. 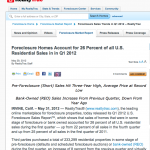 – Foreclosures now comprise 26% of all US residential sales. – Foreclosure sales are down 15% from a year ago. This entry was posted in Foreclosure by David Midgett. Bookmark the permalink.